Air Transport Association of America, et al. v. Secretary of State for Energy and Climate Change, No. C-366/10 (E.C.J., Dec. 21, 2011) (the Court of Justice of the European Union upheld the EU’s 2008 decision to include aviation in the emissions trading scheme, beginning January 2012). United States v. Rosales, No. 10-CR-0339 (D. Minn., Dec. 13, 2011) (court held that seizure of property in passenger’s bag by airport police did not violate Fourth Amendment where TSA had already conducted a constitutional search of the bag just prior to seizure). American Airlines, Inc. v. Transportation Security Administration, No. 10-1418 (D.C. Cir., Dec. 6, 2011) (court vacated and remanded TSA’s decision denying American Airlines’ request for grant funding for expenditures on advanced “in-line” baggage screening system installed by the airline at John F. Kennedy Airport). Stanton v. Fort Wayne-Allen County Airport Authority, No. 1:11-CV-00030-TLS (N.D. Ind., Dec. 5, 2011) (court granted summary judgment for the Fort Wayne-Allen County Airport Authority in a suit challenging the Authority’s rules on expressive activity, holding that the Authority’s rules requiring a permit and designating “free speech areas” at the Airport were reasonable and not overbroad). Spinrad v. Comair, Inc., No. 09-CV-4111 (E.D.N.Y., Nov. 23, 2011) (court held that passenger’s slip and fall negligence claim against airline was not preempted by the Federal Aviation Act or the Airline Deregulation Act). Diaz Aviation Corp. v. Airport Aviation Services, Inc., No. 09-1583 (CVR) (D.P.R., Nov. 7, 2011) (court dismissed Sherman Act antitrust claims regarding the sale of jet fuel at Luis Muñoz Marín International Airport). Town of Barnstable v. FAA, 659 F.3d 28 (D.C. Cir. 2011) (court vacated and remanded FAA No Hazard determinations for a proposed wind farm project, holding FAA departed from its own agency guidelines and did not provide adequate justification for the determinations). Nguyen ex rel U.S. v. City of Cleveland, No. 1:09 CV 452 (N.D. Ohio, Sept. 30, 2011) (court dismissed claims brought against the City of Cleveland under the False Claims Act and the Clean Air Act based on aircraft deicing activities at Cleveland Hopkins International Airport). Moore v. FAA, No. 10-4117 (6th Cir., Sept. 13, 2011) (court affirmed FAA’s final order and decision finding respondent airport authority did not violate Grant Assurance 22 (Economic Nondiscrimination) for imposing insurance requirements on petitioner’s flight instruction and aircraft maintenance business and enforcing lease requirements). United States v. $60,020.00 U.S. Currency, No. 08-CV-6286 (W.D.N.Y., Sept. 12, 2011) (court held 90-minute detention of passenger and his property at airport security was reasonable under the Fourth Amendment). Tobey v. Napolitano, No. 3:11CV154-HEH (E.D. Va., Aug. 30, 2011) (court held that airport commission was not subject to municipal liability under 42 U.S.C. § 1983 and that federal and local airport security personnel were not liable in their official capacities and did not violate the First, Fourth, or Fifth Amendment rights of a passenger required to comply with airport security secondary screening procedures at the Richmond International Airport). Barnes v. Dep’t of Transportation, 655 F.3d 1124 (9th Cir. 2011) (court found FAA’s decision not to complete an environmental impact statement for a proposed new runway at Hillsboro Airport unreasonable where, among other things, FAA failed to consider the environmental impacts of any increased demand for the Airport resulting from the addition of a runway). Carr, et al. v. Puerto Rico Ports Authority, et al., Civil No. 10-1170 (SEC) (D.P.R., Aug. 18, 2011) (court granted motion for partial dismissal of defendants Port Authority and janitorial company, finding Port Authority was not vicariously liable for wet floor condition causing plaintiff’s slip and fall, but that fact issues precluded summary judgment on claims against janitorial company). Electronic Privacy Information Center v. DHS, 653 F.3d 1 (D.C. Cir. 2011) (court held that TSA’s decision to use advanced imaging technology (AIT) for primary passenger screening is subject to notice and comment rulemaking and that TSA’s use of AIT for primary screening does not violate the Video Voyeurism Prevention Act, the Privacy Act, or the Fourth Amendment). Safeguarding the Historic Hanscom Area’s Irreplaceable Resources, Inc. v. FAA, 651 F.3d 202 (1st Cir. 2011) (court denied preservationist organization’s petition for review of FAA’s approval of an airport modernization project at Laurence G. Hanscom Field, holding that FAA complied with requirements of section 4(f) of the Department of Transportation Act, the National Historic Preservation Act, and the National Environmental Policy Act). Corr v. Metropolitan Washington Airports Authority, No. 1:11-cv-389 (E.D. Va., July 7, 2011) (court dismissed class action claims brought against the Authority as operator of a toll road providing access to Dulles International Airport on grounds that plaintiffs lacked prudential standing, but finding, in any event, that plaintiffs failed to state claims alleging the Authority’s collection of tolls constituted illegal exactions and violated Due Process). Center for Biological Diversity v. EPA, 794 F. Supp. 2d 151 (D.D.C. 2011) (court concluded that the U.S. EPA has an obligation under the Clean Air Act to consider whether the greenhouse gas and black carbon emissions of aircraft engines endanger public health and welfare). Southwest Airlines v. TSA, 650 F.3d 752 (D.C. Cir. 2011) (court upheld TSA’s calculation of fees imposed on airlines for screening passengers and property). Difiore v. American Airlines, Inc., 646 F.3d 81 (1st Cir. 2011), certiorari denied, No. 11-221 (S. Ct., Nov. 28, 2011) (court found that a Massachusetts law governing tips, including those received by airport skycaps, related to airline price and service and therefore is preempted by the Airline Deregulation Act). National Federation of the Blind v. United Airlines, Inc., No. C 10-04816 WHA (N.D. Cal., Apr. 25, 2011) (court dismissed a class action suit against United Airlines alleging failure to make kiosks accessible to blind persons, finding that plaintiffs’ claims that a state disability law had been violated were preempted by the Airline Deregulation Act and the Air Carrier Access Act). Parkridge 6, LLC v. U.S. Department of Transportation, 420 Fed. App’x 265 (4th Cir. 2011) rehearing denied, No. 10-1443 (4th Cir., June 14, 2011) (court affirmed district court’s dismissal of claims challenging expansion of Metrorail access to Washington Dulles International Airport for lack of standing). Afoa v. Port of Seattle, 160 Wash. App. 234 (2011) (court reversed a trial court order on summary judgment and remanded a matter involving an accident at the Seattle-Tacoma International Airport, rejecting the Port’s argument that it lacked sufficient control over plaintiff’s ground handling activities so as to owe a common law or statutory obligation to provide a safe working environment). Love Terminal Partners, Inc. et al. v. United States, 97 Fed. Cl. 355 (2011) (court held that the Wright Amendment Reform Act of 2006, prohibiting the use of 26.8 acres at Dallas Love Field Airport to which plaintiffs hold long-term lease rights, effected a per se taking without just compensation). Goodspeed Airport LLC v. East Haddam Inland Wetlands and Watercourses Commission, et al., 634 F.3d 206 (2d Cir. 2011) (court held that a local regulation requiring a tree removal permit at a private airport was not preempted, finding that the local requirements did not sufficiently interfere with federal aviation regulations to be preempted). City of Santa Monica v. Federal Aviation Administration, 631 F.3d 550 (D.C. Cir. 2011) (court rejected the City’s petition challenging the FAA’s final determination that the ban on Category C and D aircraft at the Santa Monica Airport violates the Grant Assurance against unjust economic discrimination, holding that FAA did not act arbitrarily and capriciously in concluding that the ban violated Grant Assurance 22). Director’s Determination, Springfield Flight Academy v. City of Springfield, FAA Docket No. 16-10-03 (Aug. 25, 2011) (finding no violations of Grant Assurance 22 (Economic Nondiscrimination) or Grant Assurance 23 (Exclusive Rights) relating to terms and conditions imposed on fixed base operator’s sale of fuel and provision of aviation services). Director’s Determination, RDM, LLC v. Ted Stevens Anchorage International Airport, FAA Docket No. 16-09-14 (June 7, 2011) (finding no violation of Grant Assurance 22 or Grant Assurance 23 in requiring performance milestones in a lease for an air cargo development project, and for terminating the lease upon failure to meet required milestones). Director’s Determination, Valley Aviation Services, LLP v. City of Glendale, FAA Docket No. 16-09-06 (May 24, 2011) (finding violations of Grant Assurance 19 (Operation and Maintenance), Grant Assurance 29 (Airport Layout Plan), and Grant Assurance 22 by allowing nonaeronautical use of certain airport hangars; violation of Grant Assurance 22 by requiring Complainant to reduce rental rates based on flawed appraisal; and no violations of Grant Assurance 24 (Fee and Rental Structure) or Grant Assurance 25 (Airport Revenue) by failing to collect taxes and fees for commercial and nonaeronautical businesses operating on the airport). Director’s Determination, Skydive Sacramento v. City of Lincoln, California, FAA Docket No. 16-09-09 (May 24, 2011) (finding violation of Grant Assurance 22 by denying access to an identified drop zone at the airport). Director’s Determination, Orange County Soaring Association, Inc. v. County of Riverside,California, FAA Docket No. 16-09-13 (Feb. 11, 2011) (finding violation of Grant Assurance 22 for failure to make the airport available for glider operations and violation of Grant Assurance 29 and Surplus Property Act deed restrictions). Director’s Determination, Ricks v. Greenwood-Leflore Airport/Airport Board, FAA Docket No. 16-09-04 (Jan. 24, 2011) (finding no violations of Grant Assurances 2, 5, 19, 22, 23, or 29 for terminating Complainant’s lease, for not offering another site to Complainant, and for not compensating Complainant for relocation expenses). Director’s Determination, Davis v. Jackson Municipal Authority, FAA Docket No. 16-10-01 (Jan. 18, 2011) (finding no violation of Grant Assurance 30 (Civil Rights) and Grant Assurance 37 (Disadvantaged Business Enterprises) for establishing race conscious DBE goals on federally funded projects). Risk-Based Security Screening for Members of the Armed Forces Act (Public Law No. 112-86). Surface and Air Transportation Programs Extension Act of 2011 (Public Law No. 112-30). Information on the content and status of bills can be found at The Library of Congress. Final Rule, Flightcrew Member Duty and Rest Requirements, 77 Fed. Reg. 330 (Jan. 4, 2012). Direct Final Rule, Enhancing Airline Passenger Protections: Limited Extension of Effect Date for Full Fare Price Advertising, 76 Fed. Reg. 78,145 (Dec. 16, 2011). DOT Guidance, Official Questions and Answers (Q&A’s) DBE Program Regulation, (49 CFR 26) (Dec. 9, 2011). Program Guidance Letter 12-01, Modifications to Benefit Cost Analysis Threshold (Oct. 28, 2011). Petition for Waiver of the Terms of the Order Limiting Scheduled Operations at LaGuardia Airport; Procedures for the Reallocation of Slots at Ronald Reagan Washington National Airport and LaGuardia Airport, 76 Fed. Reg. 65,773 (Oct. 24, 2011). Notice of Proposed Rulemaking, Nondiscrimination on Basis of Disability in Air Travel: Accessibility of Web Sites and Automated Kiosks at U.S. Airports, 76 Fed. Reg. 60,426 (Sept. 29, 2011). Supplemental Notice of Proposed Rulemaking, Nondiscrimination on the Basis of Disability: Programs or Activities Receiving Federal Financial Assistance, 76 Fed. Reg. 59,307 (Sept. 26, 2011). Final Rule, Limited Extension of Effective Date of Certain Provisions, Enhancing Airline Passenger Protections, 76 Fed. Reg. 45,181 (July 28, 2011). Notice, Notice of FAA Intent to Carry Over Airport Improvement Program (AIP) Entitlement Funds, 76 Fed. Reg. 44,978 (July 27, 2011). Notice of Proposed Rulemaking, Reporting Ancillary Airline Passenger Revenues, 76 Fed. Reg. 41,726 (July 15, 2011). Final Rule, Enhancing Airline Passenger Protections, 76 Fed. Reg. 23,110 (Apr. 25, 2011). Notice of Petition, Policy and Procedure Concerning the Use of Airport Revenue; Policy Regarding Airport Rates and Charges: Petition of the Clark County Department of Aviation to Use a Weight-Based Air Service Incentive Program, 76 Fed. Reg. 21,420 (Apr. 15, 2011). Airport Sponsor Assurances (Revised Mar. 2011). Compliance Guidance Letter 2011-1: FAA Implementation of Interim Policy Regarding Access to Airports From Residential Property and Review of Access Arrangement (Mar. 21, 2011). Interim Policy, Airport Improvement Program (AIP): Interim Policy Regarding Access to Airports from Residential Property, 76 Fed. Reg. 15,028 (Mar. 18, 2011). FAA Internal Memorandum, Guidance on Preparing Focused, Concise and Timely Environmental Assessments (Jan. 10, 2011). Proposed Rule, Revising Underground Storage Tank Regulations – Revisions to Existing Requirements and New Requirements for Secondary Containment and Operator Training, 76 Fed. Reg. 71,708 (Nov. 18, 2011). Draft Guidance, Improving the Process for Preparing Efficient and Timely Environmental Reviews under the National Environmental Policy Act (Dec. 7, 2011). Guidance, Appropriate Use of Mitigation and Monitoring and Clarifying the Appropriate Use of Mitigated Findings of No Significant Impact (Jan 14, 2011). Transportation Security: Actions Needed to Address Limitations in TSA's Transportation Worker Security Threat Assessments and Growing Workload, GAO-12-60 (Dec. 8, 2011). Transportation Security Information Sharing: Stakeholders Generally Satisfied but TSA Could Improve Analysis, Awareness, and Accountability, GAO-12-44 (Nov. 21, 2011). Initial Pilot Training: Better Management Controls Are Needed to Improve FAA Oversight, GAO-12-117 (Nov 4, 2011). Aviation Safety: Enhanced Oversight and Improved Availability of Risk- Based Data Could Further Improve Safety, GAO-12-24 (Oct. 13, 2011). Next Generation Air Transportation System: FAA Has Made Some Progress in Implementation, but Delays Threaten to Impact Costs and Benefits, GAO-12-141T (Oct. 4, 2011). Aviation Security: TSA Has Made Progress, but Additional Efforts Are Needed to Improve Security, GAO-11-938T (Sept. 16, 2011). Airline Passenger Protections: More Data and Analysis Needed to Understand Effects of Flight Delays, GAO-11-733 (Sept. 14, 2011). Department of Homeland Security: Progress Made and Work Remaining in Implementing Homeland Security Missions 10 Years after 9/11, GAO-11-881 (Sept. 7, 2011). Aviation Security: TSA Has Taken Actions to Improve Security, but Additional Efforts Remain, GAO-11-807T (July 2011). Aviation Security: TSA Has Enhanced Its Explosives Detection Requirements for Checked Baggage, but Additional Screening Actions Are Needed, GAO-11-740 (July 2011). General Aviation: Security Assessments at Selected Airports, GAO-11-298 (May 2011). Airport and Airway Trust Fund: Declining Balance Raises Concern over Ability to Meet Future Demands, GAO-11-358T (Feb. 2011). Federal Aviation Administration’s Progress and Challenges in Developing and Transitioning to the Next Generation Air Transportation System (Oct. 5, 2011). More Rigorous Oversight is Needed to Ensure Venice Municipal Airport Land Sales and Leases are Used Appropriately, Report No. AV-2011-180 (Sept. 29, 2011). FAA Oversight Is Key For Contractor-Owned Air Traffic Control Systems That Are Not Certified, Report No. AV-2011-149 (Aug. 4, 2011). FAA Did Not Ensure Revenue Was Maximized at Denver International Airport, Report No. AV-2011-057 (Feb. 2011). Synthesis 30 – Airport Insurance Coverage and Risk Management Practices (Dec. 2011). Report 58 – Airport Industry Familiarization and Training for Part-Time Airport Policy Makers (Dec. 2011). Report 57 – The Carbon Market: A Primer for Airports (Dec. 2011). Synthesis 31 – Airline and Airline–Airport Consortiums to Manage Terminals and Equipment (Dec. 2011). Legal Research Digest 12 - Fair Disclosure and Airport Impact Statements in Real Estate Transfers (Nov. 2011). 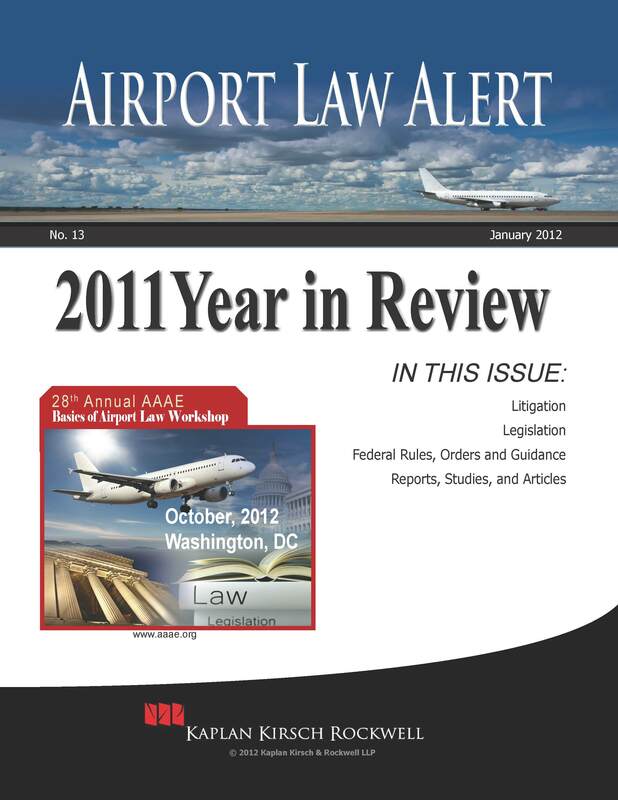 Report 54 – Resource Manual for Airport In-Terminal Concessions (Oct. 2011). Synthesis 25 – Strategies for Reuse of Underutilized or Vacant Airport Facilities (Oct. 2011). Synthesis 27 – Airport Self-Inspection Practices (Sept. 2011). Report 53 – A Handbook for Addressing Water Resource Issues Affecting Airport Development Planning (Sept. 2011). Synthesis 24 – Strategies and Financing Opportunities for Airport Environmental Programs (Aug. 2011). Report 44 – A Guidebook for the Preservation of Public-Use Airports (July 2011). Report 47 – Guidebook for Developing and Leasing Airport Property (June 2011). Legal Research Digest 11 – Survey of Minimum Standards: Commercial Aeronautical Activities at Airports (Feb. 2011). Report of the Committee for a Review of U.S. Department of Transportation (USDOT) Study on Implementation of Changes to the Section 4(f) Process, (Sept. 15, 2011). D. Volchok, US Airways v. O’Donnell: The Tenth Circuit Upholds Broad Federal Preemption of State Regulation of Airlines, 23 Air & Space Lawyer, No. 4 (2011) (subscription required).